We will create a vbs script, clicking itself will select all files and folders where it is located. 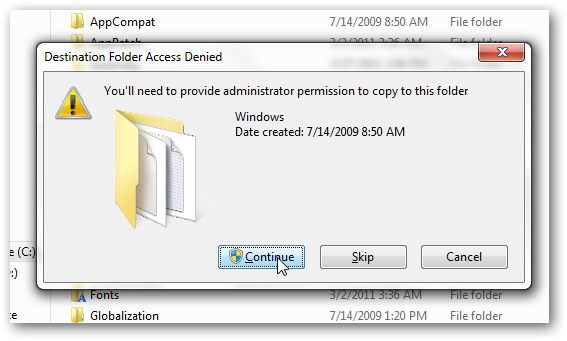 Obviously, it is not possible to carry or copy paste this vbs script in every folder throughout your Windows 7 PC. So, we will move further. We will integrate this vbs script with a registry file to right click context menu, so that it becomes universally working in all folders. set oShell = WScript.CreateObject("WScript.Shell") oShell.SendKeys "^a"
Save it as select_all.reg ; make sure to select All files as file type in Notepad while saving it (just like above). How to remove this select all option from right click context menu? Delete the vbs file from Windows folder. Create another registry file (or edit the above) ; just add a minus sign after beginning of each HKEY (just after ending of the third bracket; for the above reg key, you have to add at four places, right?). Like this: -HKEY_CLASSES.... It does not matter what ever you name the file. Run the registry file and you will get rid of the select all option from right click context menu. As always, all the required vbs script, registry files are here for you. Click here to download the rar file and you can use immediately without any codings. This Article Has Been Shared 3546 Times! 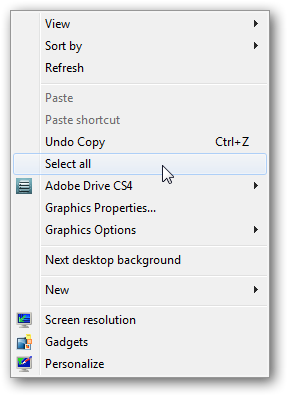 Cite this article as: Abhishek Ghosh, "Add select all option to right click context menu in Windows 7," in The Customize Windows, April 8, 2011, April 21, 2019, https://thecustomizewindows.com/2011/04/add-select-all-option-to-right-click-context-menu-in-windows-7/.